A male Human in the Tube Transport System. 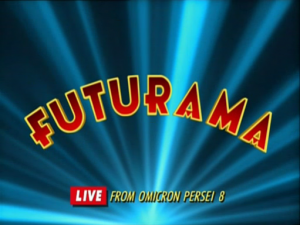 The opening sequence starts with the Planet Express ship flying, as it passes the letters of Futurama appearing in the middle of the screen and a caption that differs in each episode. 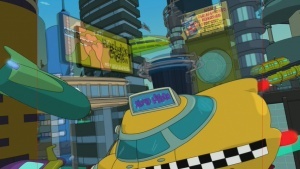 The ship flies through the 'R' of the title into New New York, and the camera shows different parts of the city, with a lot of hovercars, buildings, people in the Tube Transport System, and advertisements, until it comes to a large screen on top of a building, which shows a real-life cartoon that also differs in each episode. After the cartoon, it shows the credits, and the Planet Express ship then crashes into the screen. See this for a list of alien language sightings in the opening sequence. This procedure is almost identical to The Simpsons openings, as both of the series were created by Matt Groening. Some episodes (especially in Season 1, Season 2, and Season 6) have short chapters called the cold opening before the opening sequence. This could for example be a sponsor, a recap (in Season 5 and the Season 6 premiere) or a shorter joke. In Season 6, most of the episodes so far have had the opening sequence abbreviated, eliminating some of the parts showing the flight of the Planet Express ship as well as the opening cartoon. In some episodes the traditional theme is different and sometimes has the cast singing. 2....2, 3. The accompanying music makes use of the rarely used boobams and tubular bells. The theme, like much of the show's music, is composed by Christopher Tyng. People widely regard Pierre Henry's 1967 Psyché Rock to be a great influence on the theme. This tune can be heard on YouTube. Throughout New New York, the tube system features characters from the show, some primary and some secondary. "Bender Should Not Be Allowed on Television"
In the Futurama movies, the opening sequence is a bit different from the show's regular episodes, and differs with each movie. For the episodes made from these films, the first of each four features the film's opening, while parts 2, 3 and 4 have the classic introductions' title caption and billboard crash with a recap in between. Difference between series and movie. In Bender's Big Score, the opening sequence was largely changed. 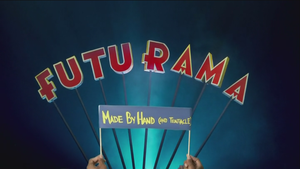 While it did have the same graphics in the background, it also had introductions of each of the main characters to an alternative version of the normal theme, which had been created for the Futurama game. Since it was a film, there was no information about who created the show on the opening monitor, just the film's name. The title caption says: "It just won't stay dead!" The opening sequence for The Beast with a Billion Backs is much like that of the series. However, instead of the Planet Express Ship crashing into the giant screen, it goes into the screen, starting a short 1920s-style cartoon that strongly parodies "Steamboat Willie." After this sequence, the opening resumes as normal with the ship exiting the cartoon and breaking the screen as usual. The title caption says: "The proud result of prison labor." 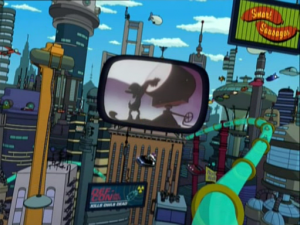 The opening sequence for Bender's Game is identical to the regular sequence, but like the sequence for The Beast With A Billion Backs, the Planet Express Ship goes through the giant screen into a parody of "Yellow Submarine." When the title appears, it shows Bender thumping his chest like Donkey Kong, and the ship crashes out of the screen with a bunch of flowers. The title caption says: "The flames on your television are not part of the show." The opening sequence for Into the Wild Green Yonder is largely different from the others. The main difference is that it takes place in Mars Vegas and Seth MacFarlane sings a completely different song from the normal opening sequence. The title caption says (in Alien Language 1): "The humans shall not defeat us." The opening sequence was re-created in live action for the episode "Viva Mars Vegas". None of the characters seen in the tube system appear in the pilot episode, except for Smitty. The guy that comes before Amy used to have a hook for a hand until, during the opening of Bender's Big Score, he doesn't have a hook anymore. Instead it is replaced with a real hand. In Season 6 when the opening sequence is shorter, the original song is replaced with the one from the opening of Bender's Big Score, except without the character voices. The intro for the new episodes appears to look more cyan-like than the green-blue intro from the original series. In the Netflix versions, some title gags appear in the captions over a blank intro. Repeating joke of Leela crashing into the screen, since she only has one eye.